When aeroplane engines still had propellers and flying times were much longer than they are today, the imaginary Trans-Orient-Pacific Airline sent one of its flights into movie history. It was producer and star John Wayne’s The High and the Mighty (1954), based on Ernest K Gann’s novel, in which, under William Wellman’s direction, the plane carried an all-star collection of crew and passengers in the first of many cliché-ridden aerial disaster films. If there ever was a movie where music played such a profound role in lifting the emotion of the story, it is in Tiomkin’s soaring score for this dramatic film. The composer described the theme as ‘a symphonic expression of sublime strength rising to the heavens!’. Wayne can be heard whistling the tune a few times in the film. 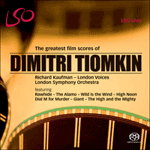 For his score, Tiomkin received his third Academy Award.